With winter coming on, I'm getting more and more excited for curing and preserving meat. 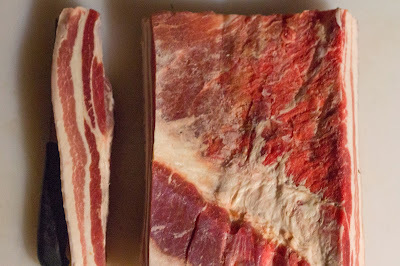 I've cured a good deal of pork belly in my day, from bacon to pancetta, but I wanted to try curing some bacon completely, as you would prosciutto or or coppa. If you google "dry cured bacon," you'll find a lot of recipes for bacon that's cured with a dry rub - just salt and sugar. Most bacon is wet-cured, meaning it's soaked in a salt water brine, which makes the meat take on a good amount of water. This excess water is why so much commercial bacon shrinks up in the pan and releases an opaque, watery juice that makes the bacon steam more than fry. But what I'm trying to do here is cure the bacon, as you would salami, where it will take on 3% salt and dry cure over a few weeks until it loses 30% of its starting weight (5lb 10 oz). Then you could actually eat the cured pork belly raw, just as you would prosciutto or salami. Most of the recipes for dry cured pork bellies are for pancetta, not bacon. So in forming this recipe, I found a recipe for pancetta d'affumicat, or smoke pancetta. This would also be similar to a belly cut of Austrian speck. But, interestingly enough, this cut traces to when Northern Italy was controlled by Austria by the Habsburg Monarchy in the 14th century. Of course, to end with good cured pork, you need to start with good piggies, and I cut this with a 14 lb belly from North Woods Ranch, right by Carla's family house in Baden. I've ordered a lot of pork online, from D'artagnan to Hertiage Foods USA, but its amazing to find such a perfect belly only a 15 minute drive down the road. Sure, a lot went into this hog, but that was mostly time outside rooting and snooting about on open pasture. 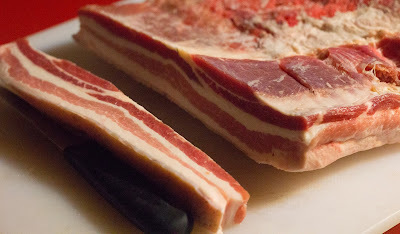 But nature knew best, and you can see this in this amazing pork belly. I'm very excited to see this belly cure and age over the next coming weeks, and then get some of this belly in my belly!